Per my earlier promise, lets try and get our minds wrapped around the tax proposals the Republican hopefuls are trying to champion. Good place to start. Lets start with how Cain describes it, per his website. 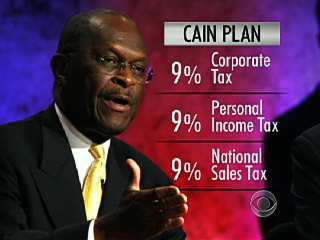 Cain's plan hopes to replace the complex system of the tax code with a 9% rate for corporate tax, income, and sales tax. In addition, he eliminates capital gains, estate tax, and most deductions from the current code. The idea is to get rid of loopholes and kickbacks for certain individuals and businesses, cut taxes for most people, and pave the way for an ultimate transition to the "fair tax," which is a true, flat, consumption tax. The tax policy center has taken pen to paper, and the plan would provide tax breaks, as long as your not in the 84% of Americans who would see their taxes increase. This is bad. It is even worse when you are in the $10,000 - $20,000 range, as you will see your taxes increased by, wait for it, 950%. Robin Hood he is not. Getting rid of the estate tax is also a tax break for the rich, and would have to be paid for somewhere else. The national sales tax, which he claims is not a pure consumption tax, is a pure consumption tax, and unless I am missing something would hike the prices of goods and services and be a nightmare to coordinate with the various state and national sales taxes already in place. The ideas to get rid of taxes on capital gains are positive. Incentives to invest and save are the cornerstones of many tax policies, and these can have staying power. After the release of this study, Cain has responded with tweaks. Now, Cain says he would exempt those below the poverty line (~$22,00 in income), and have exemptions for "opportunity zones," defined by high unemployment and poverty. Color me crazy, but isn't an "opportunity zone," which no doubt will provide breaks for some who don't deserve and take away breaks for those who need them, creating the same disparities and inconsistencies Cain is fighting to remove? Further, even if you exempt the poor from the income tax, the poor spend a higher percentage of their income on goods and services, which under the 999 plan will be more expensive. Doesn't get you there. I don't think consumption taxes work. This plan is just that, and what you don't see are the 9% that will hit every piece of a supply chain: there is no way goods and services do not increase in price under this plan, which is not what America needs. The ideas to cut corporate and capital gains are solid, but the rest of the plan only works if you are wealthy. While this plan could have some legs in certain countries under certain economic times, I do not believe it is the answer for America's tax and economic future, due to its previously listed shortcomings. The simplicity is great, but our economy is not: I give the 999 plan a D+, passing only because it is simple and cuts taxes on savings and investments. America can do better. 999 more like 666 Obama for PREZ! Well, the article is in reality the most useful on this worthw hile topic. I harmonise with your conclusions and will certainly thirstily look forward to your approaching updates. Simply saying thanks can not just be enough, for the enormous lucidity in your writing. I definitely will without delay grab your rss feed to stay abreast of any updates. Admirable work and also much success in your business enterprize!